Earlier in the week, I mentioned the appearance of an African-American character in the 1950 Fawcett story, "Tears in the Night" that embodied the stereotypical "mammy" character so popular in antebellum and early 20th-century American culture. Fast forward twenty years to 1971 and shift your attention to the DC romance comics line -- could this "mammy archetype" still live on, even after the events of the Civil Rights Movement? As you will see in "Someone to Love!" from DC's Girls' Love Stories #159 (May 1971) (pencils by Werner Roth) the stereotype of African-American women as inherently motherly figures (especially to their white charges) curiously lingers on -- despite the story's good intentions and attempts at diversification and inclusion. When the Adams family moved into Greenville Heights, twelve-year-old Celia Johnson was anxious to meet her new neighbors. The rest of the neighborhood, however; was less than amused by an African-American family in their midst; relentlessly picketing and harassing the new family. No, you are not imaging things. You have seen that handshake before -- in the saga of Margo and Chuck, also penciled by Werner Roth. Accompanied by little Celia, Mr. and Mrs. Johnson are welcomed into the Adams home for a snack of coffee and cake. Celia and fellow twelve-year-old -- Angela, become fast friends and together, graduate from an interest in dolls to a fascination with boys and romance. Though it seemed neither one of them would ever find a boy to date before long Celia woos studly and sensitive Philip. Angela, however; has not yet met anyone and wonders if she ever will. Love isn't far behind for Angela luckily. When an errant football collides with Angela's hand, dreamy football player Lee Stanley rushes over to comfort her and a romance between the two is quickly ignited. Ecstatic about their new situations and their packed social calendars, Angela and Celia can hardly contain their joy. As the weeks fly by, the boys suddenly seem to gain popularity with the other young females of the school -- leaving little time for Angela and Celia. Celia racks her brain to think of what they may have done to obscure the attention of their guys. Angela explains that it isn't their fault, but that "...some men are like that! Once they know we love them, they take us for granted!" Refusing to give up on Lee, Angela is there for him when his adoring female fans leave him in the dust after he costs the school the football game against their rival, Fairfield. Appreciating her loyalty and love, Lee apologizes for his behavior and promises to never hurt Angela again. Philip still hasn't come around to Celia, but Angela promises her friend that she will try to make things right between the two. Celia is unsure what Angela has up her sleeve, but trusts Angela, who declares, "Never you mind, you just leave everything to Auntie Angela!" It is in this panel that Angela embodies characteristics of the dutiful "mammy." In the end, Angela's scheme of persuading another boy at school to write a love note to Celia and drop it within eyesight of Philip to make him jealous works like a charm. It isn't long before the two couples are back to double dates and warm embraces. 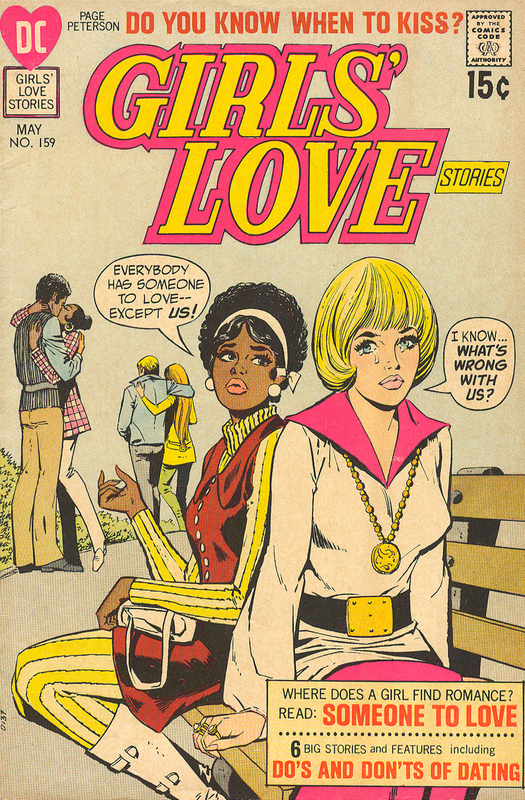 Overall, while "Someone to Love" is a cute story that attempts to show that skin color has no bearing on friendship and comradery between women, it simultaneously very subtly (and most likely unintentionally) pegs African-American Angela into a motherly role in relation to her white friend Celia. Surprisingly, this "mammy" type character shows up in quite a few romance stories from the 1970s. Though DC made sincere strides in presenting diversity in their romance comics, they were unable to completely shake the specters of the past. Selling Romance - Diversity in Wigs!